Our experience in winding the finest internal wirings of purest copper for our tone-arms made us following this philosophy for specific Speaker cables. Each conductor is made of ten ultra-thin copper wires, pairwise twisted and casted into nylon, shielded by an extra apiral-wire. 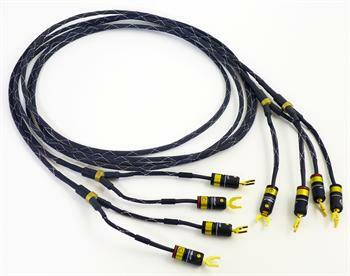 They are available from 2.0 to 7.0 meter length with Spade or Banana terminations. ...You will be amazed by their natural sound and musicality"